He died over half a century ago. But tales live on about Earl Lessley, the “flying cowboy”! Earl Lessley was born in 1889 in Drytown, California. His parents, Mary and Samuel Lessley, had crossed the plains from Missouri by covered wagon. Even after they arrived in California, the family evidently moved around a bit; a second son, Ray, was born in 1892 in nearby Volcano. 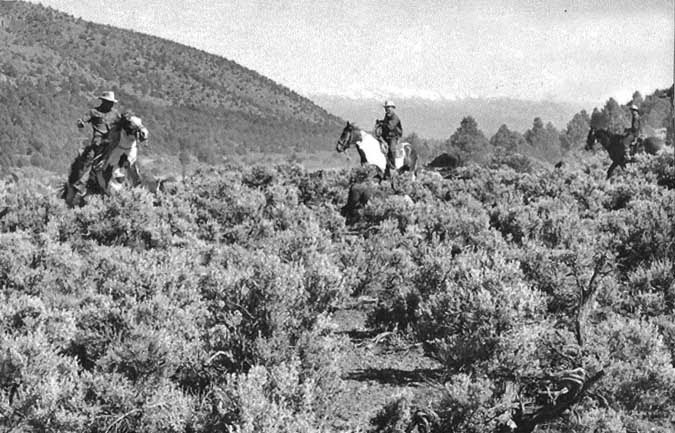 Earl Lessley (left) on a cattle drive with George Koenig. (Photo courtesy of Judy Wickwire). Earl’s prowess as a horseman was legendary. Astride a spirited horse named “Fighting,” Lessley took first prize for best rider in the finals at the American Legion rodeo in Carson Valley in June, 1928. As the years went by he would become a well-known “old vaquero” at Vaquero Cow Camp, the summer range for Dangberg cattle in Bagley Valley. 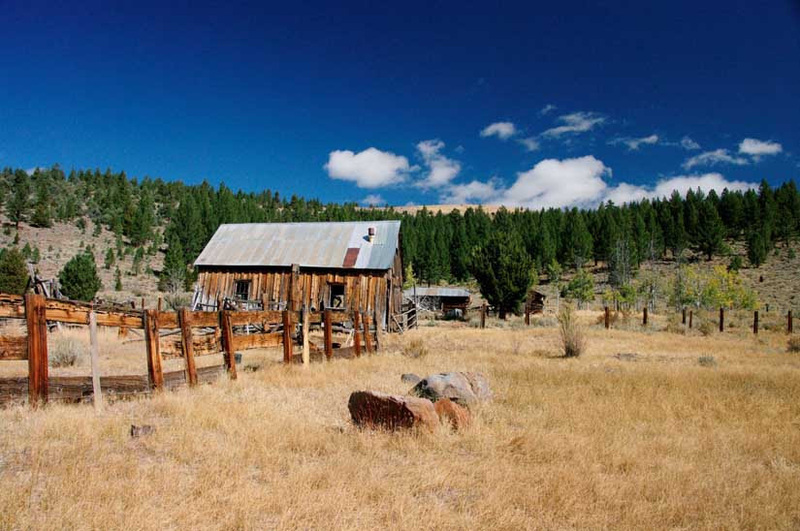 Vaquero Cow Camp in Bagley Valley, Alpine County, California. (Courtesy of Judy Wickwire). 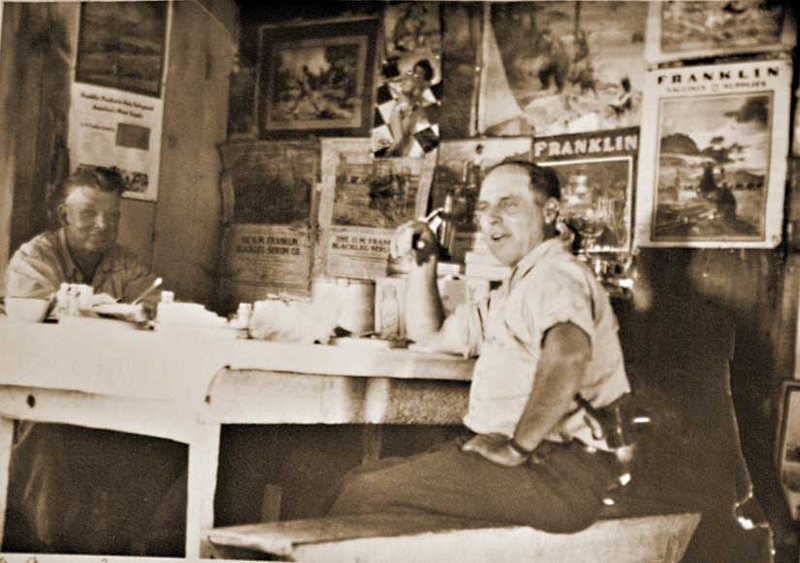 Earl Lessley (left) with unknown friend in the bunkhouse at Vaquero Camp. (Photo courtesy of Judy Wickwire). Despite this inauspicious beginning, the landing strip at Vaquero Camp continued to be used — though not always successfully. 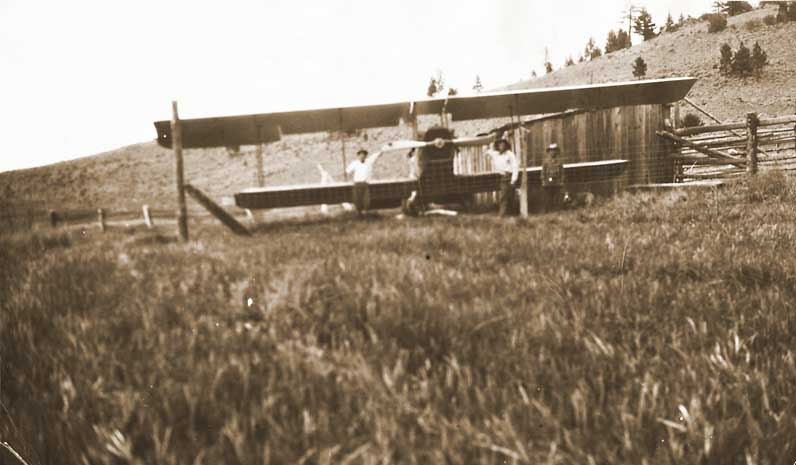 When a second plane also crashed, the practical Lessley happily scavenged parts from the wreck to reuse on the ranch. A third pilot, too, is said to have crashed, escaping with only a broken arm. Other near-apocryphal tales about Lessley paint a picture of a grizzled outdoorsman. Like many of his generation he disdained doctors; developing “foot trouble” (possibly frostbite or gangrene), Lessley simply lopped off part of his own toes with an axe. He also enjoyed a frontiersman’s wicked sense of humor. Lessley once pranked local fishermen by stuffing the hind-quarters of a dead bear into a pair of old Levis then half-buried the carcass in a river bank where he knew they would find it! In 1952, Lessley suffered a concussion in Carson Valley when a horse fell on him. He told his coworkers to leave him there, saying he was content to die in camp. His fellow cowboys didn’t listen, however, successfully carting him out on a stretcher for medical treatment. Lessley’s end came three years later — and a rather ironic end it was for an old cowboy. It was April 17, 1955, and the spring winds through Carson Valley were strong and gusty. Lessley was working on his car at the Klauber Ranch, and had jacked up the vehicle and crawled underneath. The car slipped off the jack, possibly from the gusty wind. The rear axle landed on Lessley’s chest. His body was discovered the next day by Hans Dunwebber, a fellow employee. If there was any happy news in the tragedy, it was that Lessley was said to have died instantaneously. He was 66 years old. 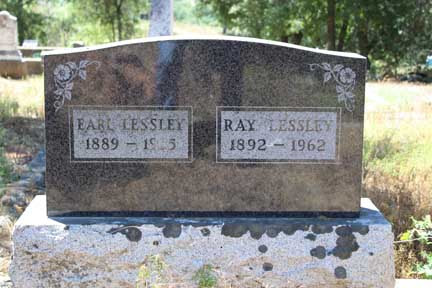 Earl Lessley’s grave, shared with his brother, Ray. Prominent locals Bill Hellwinkel and Otto Heise traveled all the way from Carson Valley to Jackson to pay their respects at Earl’s funeral — a touching indicator of the extremely high regard in which he was held by his community. For additional information about Earl Lessley and the vaqueros at Bagley Valley, check out Judy Wickwire’s wonderful book, “Land Use Patterns in Bagley and Silver King Valleys” (Clear Water Publishing, 2017) — available at the Alpine County Museum in Markleeville! Contact the Museum at: (530) 694-2317. Previous Previous post: Snowshoe Thompson’s Headstone — Stolen?? Next Next post: Summit Lake Mysteries (in Alpine County, CA) . . .